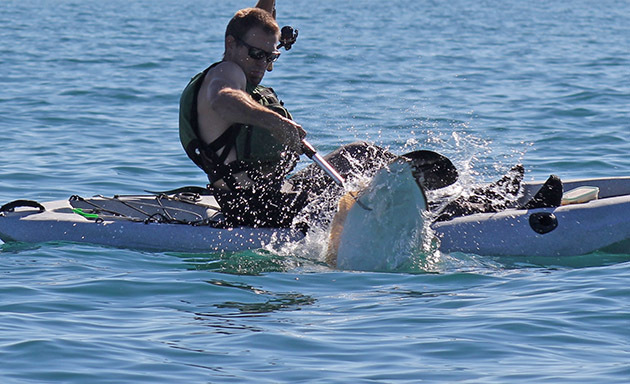 There are currently several opportunities for kayak fishermen to fish remote waters with sport boat or skiff support for safety and comfort. 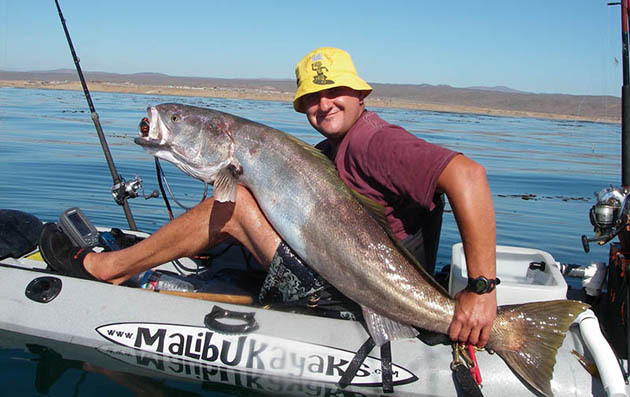 Cedros Island offers kayak and skiff trip packages; this would be on any serious kayak anglers bucket list or should be! The Islander offers trips from 1-3 days fishing San Clemente Island where you eat like kings and sleep in state rooms when you are not pulling on big fish from your kayak in Pyramid Cove. One of the most appealing aspects of fighting a big fish from the kayak is feeling the power of that fish pulling you across the water and then ultimately turning the tables on the fish as it sounds and you slowly pump and wind it to the surface. All this is happening with you sitting mere inches above the water level. You can best big fish on lighter tackle, leaving you with a greater sense of accomplishment and battles that stay with you forever. Dropping a little kayak off the stern of your well-equipped fishing machine of a skiff may sound crazy because it kind of is and that is what makes it so much fun. The local islands are chock full of opportunities to fish spots not as easily accessible to your boat. Boiler rocks for bass or seabass and halibut in tight to the beaches. 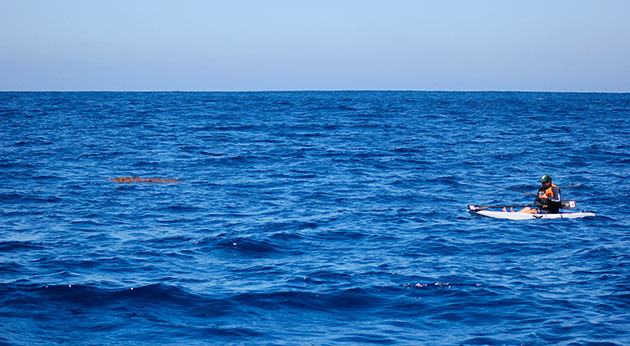 Kayaks are well known for their stealthy capabilities, this will increase your odds with skittish species like white seabass and you will get a little closer to seeing other marine life like whales, dolphin and even occasional sea turtles. Dropping a kayak in open water up wind of a bird school or paddies may not make sense to most, but don’t knock it until you have tried it. There is something to be said about floating above all that blue water, physically propelling yourself in this primal vessel, so simple and small. Deploying a kayak from a boat can be incredibly easy with the right kayak, something fairly light and relatively short with adequate weight capacity and stability. Malibu kayaks Mini X and Stealth Nine are a couple good examples that have proven to work very well. These are both just over nine feet long, 33 inches wide make them stable and they have weight capacities of 300-pounds. You do not need to be rigged to the hilt when you have a mother ship nearby for support. You don’t really need the length that provides glide for long paddling. There is no hopping over the engine cover or wrapping around the out drive. You also experience sitting through the whole process. 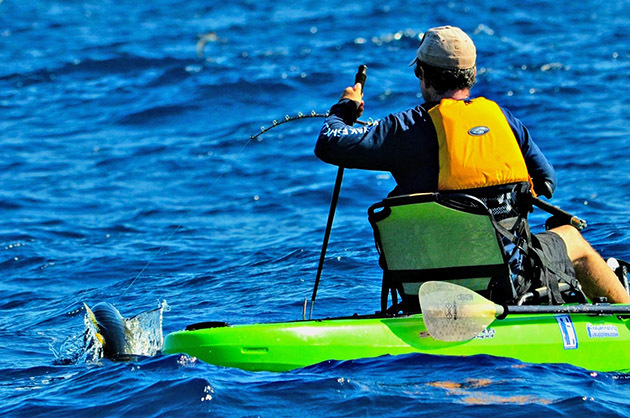 These shorter kayaks make it very easy to maneuver your rod tip beyond the bow on either side a fish will take you. Secure your catch and paddle it back to put it on ice. If you have dreams of achieving an IGFA record and are considering ways to increase your odds in this pursuit you may want to consider the kayak in this equation. It can increase your odds as it acts as a secondary drag in tiring big fish. If you consider yourself a bit of an adrenalin junkie who loves to try anything new and exciting you really need to give this a try. Knowing your limits is crucial, safety gear, a personal flotation device worn as well as a hand held radio to communicate with your vessel and a crew that you can depend upon will guarantee your success in creating the right kind of fishing stories that you will be telling.